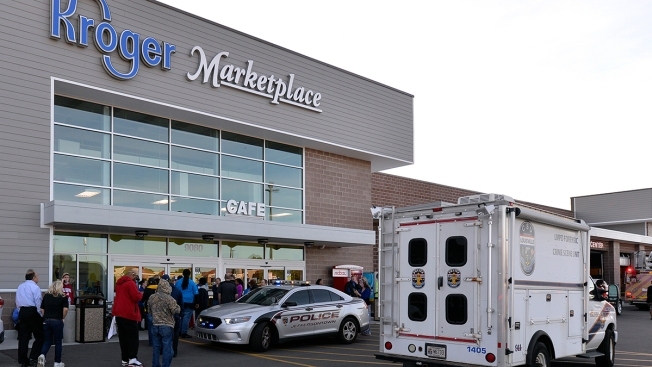 In this Oct. 24, 2018, file photo, employees wait outside the entrance of a Kroger grocery following a shooting that left two people dead in Jeffersontown, Ky. The man accused in the shooting deaths of two grocery store patrons in Kentucky has been indicted on two counts of murder. Prosecutors say Gregory Bush was indicted Wednesday by a Jefferson County grand jury in the shootings a week ago at a Kroger store in suburban Louisville. Bush also was indicted on one count of criminal attempted murder and two counts of first-degree wanton endangerment. Bush's case will proceed to Jefferson County Circuit Court in Louisville. Bush was seen on surveillance video trying to enter a historically black church minutes before the shootings at the grocery store. He was not able to enter the church, police said. A federal prosecutor has said federal investigators are examining if there were any violations of federal law, including potential civil rights violations such as hate crimes. Bush is white and the two victims were black. The police chief of the town outside Louisville where the shooting happened said he believes the killings were racially motivated. The 51-year-old Bush is being held in a local jail.